Just hours after Apple completed its initial iPad Air worldwide rollout on Friday, certain models are already seeing stock outs in the U.S., but a handy Web-based tracker searches nearby Apple Stores for supply on hand. As noted by CNET, developer Mordy Tikotzky has once again created an Apple product tracking tool, this time for those looking to nab a new iPad Air on launch day, a prospect becoming increasingly slim as first day supplies of certain models run dry. According to the Online Apple Store, high-capacity versions of the Air are showing stock outs across the nation, especially the top-end 128GB model in both Wi-Fi and Wi-Fi + Cellular. Constraints are most severe with the space gray 128GB T-Mobile version, which is now showing estimated shipment times of 5 to 10 business days. 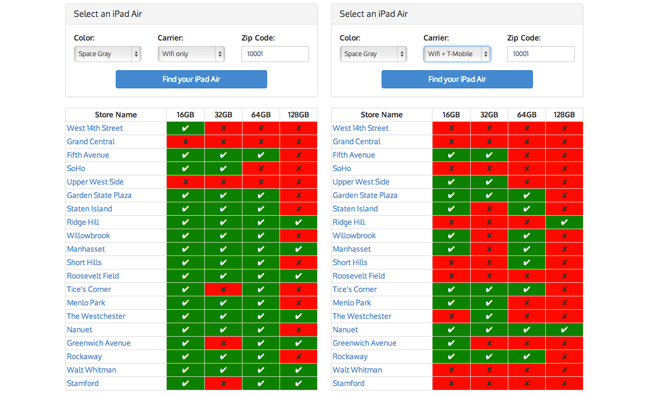 To help consumers, Tikotzky developed a tool that allows users to display iPad Air in-store pickup availability at the 20 closest Apple Stores. As with the website's iPhone 5s tracker, the iPad Air version will soon have a feature that notifies users via email when stock is available. The tool works by compiling and reformatting data pulled in from Apple's official online store. It should be noted that the represented information is limited to in-store pickup purchases only, and does not necessarily reflect stock on hand. The best bet would be to call a local Apple Store to check supplies before going down. In addition to the iPad Air, Tikotzky also has trackers for the iPhone 5s and is readying the tool to handle Apple's upcoming iPad mini with Retina display. Supply of the smaller 7.9-inch tablet is expected to be extremely tight when it launches later in November, as LCD manufacturers are reportedly seeing lower than expected yield rates.